In 2015, 26 two- and four-year institutions received grants to help implement and sustain technology-mediated advising reforms. With support from these Integrated Planning and Advising for Student Success (iPASS) grants, the colleges launched or enhanced technologies and related structural and procedural changes that would enable them to provide holistic, long-term support to all students by 2018. CCRC is analyzing key performance indicators (KPIs) of short- and long-term student outcomes at these institutions—including those measuring credits earned, grade point average, progress in developmental and gateway courses, retention, and completion—to better understand progress made under the advising reforms. Recognizing an institution’s baseline level of performance prior to implementing a reform is critical to determining the reform’s effectiveness. 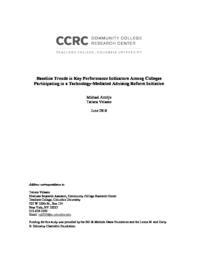 This paper provides baseline KPIs for 22 of the 26 colleges that were awarded an iPASS grant. Prior to the start of their funded iPASS reforms, grantee colleges exhibited wide variation in KPIs, with four-year institutions generally exhibiting higher performance than two-year institutions. The analysis of multiple KPIs across a time period prior to the iPASS grant period establishes that outcomes on these measures remained relatively stable for several years across the institutions. This stability will allow CCRC to better interpret changes in the KPIs that may occur after the reforms are fully implemented.